Scientists have used the National Science Foundation’s Very Long Baseline Array (VLBA) radio-telescope system and NASA’s Cassini spacecraft to measure the position of Saturn and its family of moons to within about a mile — at a range of nearly a billion miles. This feat improves astronomers’ knowledge of the dynamics of our Solar System and also benefits interplanetary spacecraft navigation and research on fundamental physics. 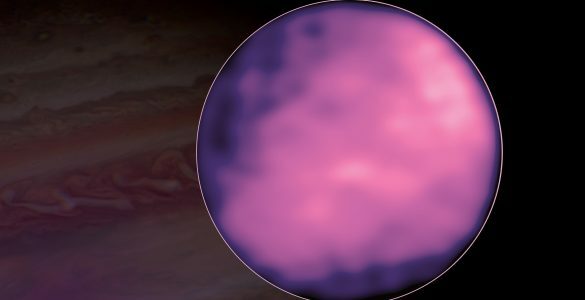 The researchers, from the National Radio Astronomy Observatory (NRAO) and NASA’s Jet Propulsion Laboratory (JPL), used the continent-wide VLBA to pinpoint the position of Cassini as it orbited Saturn over the past decade by receiving the signal from the spacecraft’s radio transmitter. 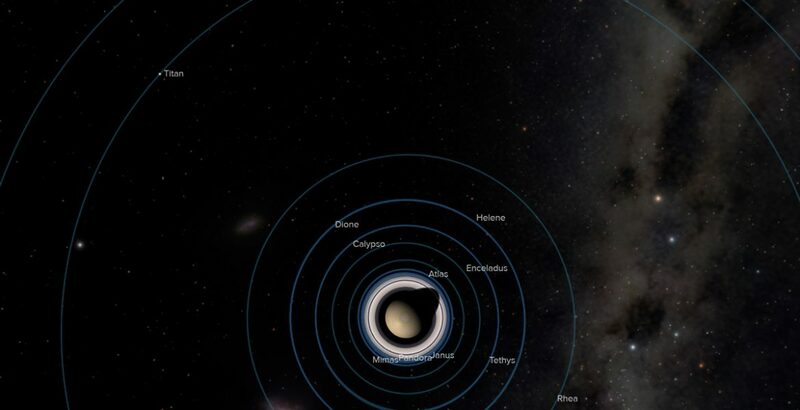 Combined with information about Cassini’s orbit from NASA’s Deep Space Network, the VLBA observations allowed the scientists to make the most accurate determinations yet of the position of the center of mass, called the barycenter, of Saturn and its numerous moons. The scientists presented the results of their work at the American Astronomical Society’s meeting in Seattle, Washington. 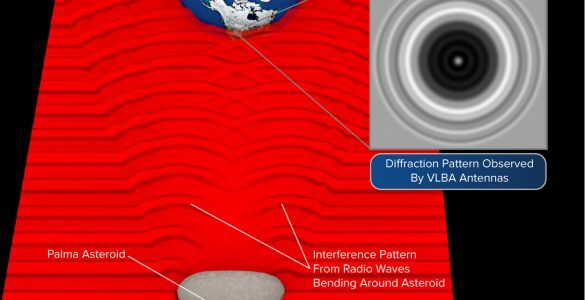 The measurement, some 50-100 times more precise than those provided by ground-based optical telescopes, was possible because of the VLBA’s great resolving power, or ability to discern fine detail. With its 10 dish antennas spread from Hawaii to the Virgin Islands, the VLBA operates as a single radio telescope with a virtual size nearly equal to the Earth’s diameter. The result is a greatly improved ephemeris — a table of predicted positions — for the Saturnian system. 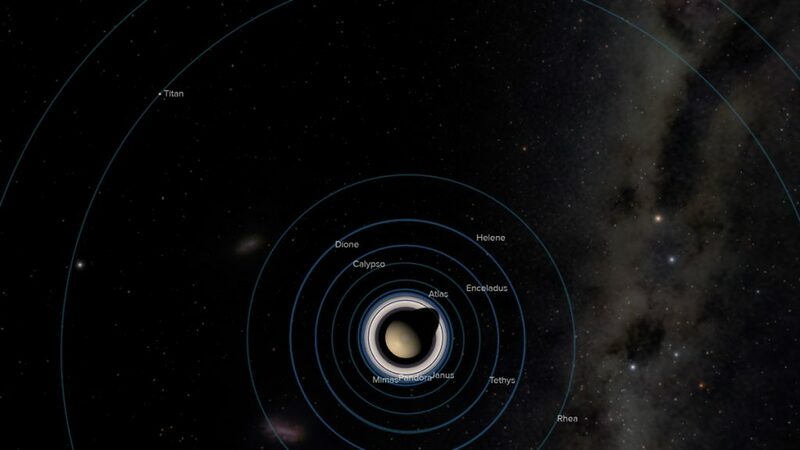 “An accurate ephemeris is one of the basic tools of astronomy, and this work is a great step toward tying together our understanding of the orbits of the outer planets and those of the inner planets,” said Dayton Jones, of JPL, in Pasadena, California. “The orbits of the inner planets are well tied together, but those of the outer planets, including Saturn, have not been tied as well to each other or to those of the inner planets,” Jones said. The improved positional information will directly benefit scientists’ ability to precisely navigate interplanetary spacecraft. In addition, it will help refine measurements of the masses of other Solar System objects. Also, the positional precision will improve predictions of when Saturn or its rings will pass in front of background stars, events that provide a variety of research opportunities. Other benefits will come to studies of several aspects of fundamental physics. The new positional information will help researchers improve their precision when timing the radio pulses from pulsars — spinning superdense neutron stars. Such timing will help answer unsolved questions about particle physics and the exact nature of the highly-compressed material inside a neutron star. 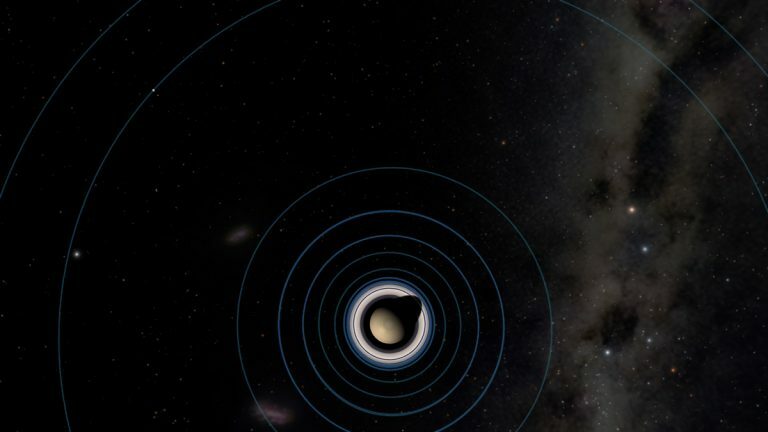 Ongoing projects that time the pulses from multiple pulsars spread across our Milky Way Galaxy in an attempt to detect the effects of passing gravitational waves also will benefit from the improved Saturn ephemeris, which also improves the overall Solar System ephemeris. VLBA measurements of the position of Cassini have even helped scientists who seek to make ever-more-stringent tests of Albert Einstein’s theory of General Relativity by observing small changes in the apparent positions of strongly-emitting quasars as Saturn passes near them on the sky. The position the scientists determined is that of the barycenter — the center of mass — of Saturn and its moons. When two bodies are in orbit, they both rotate about the barycenter. For example, the barycenter of the Sun and Jupiter is just outside the surface of the Sun, and the barycenter of the Earth and our Moon is about 1700 kilometers beneath the Earth’s surface. The barycenter of Saturn and its largest moon, Titan, is about 30 kilometers from the center of Saturn. The barycenter of Saturn and all its moons (some 62 at current count) is what follows an elliptical orbit around the Sun. In other studies, the VLBA has been used to measure the positions of Mars-orbiting satellites, and Voyager 1, the most distant man-made object, now some 12 billion miles (19 billion kilometers) from Earth on a journey that began with its launch in 1977. In 2016, NASA’s Juno spacecraft will begin orbiting Jupiter. “We plan to use similar techniques on this spacecraft, and improve the orbit for Jupiter as well,” Jones said. Jones worked with William Folkner, Robert Jacobson, and Christopher Jacobs, all of JPL, and Jon Romney, Vivek Dhawan, and Edward Fomalont, of the NRAO. The National Radio Astronomy Observatory is a facility of the National Science Foundation, operated under cooperative agreement by Associated Universities, Inc. JPL, a division of the California Institute of Technology, Pasadena, manages the Cassini mission and Deep Space Network for NASA. Artists's conception of Saturn and its moons, seen from above its pole. Same image as above, without labels. 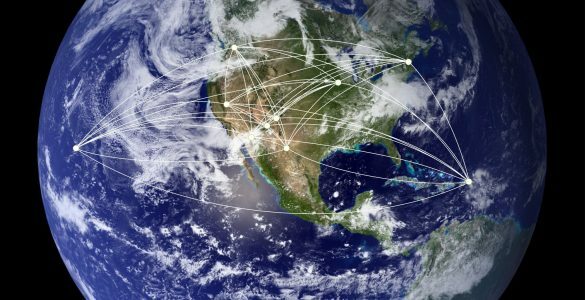 After two years as an independent facility, the VLBA once again is part of the NRAO, and will get a significant technical upgrade. Astronomers used the VLBA in an unusual way to learn new details about an asteroid’s size, shape, and orbit. 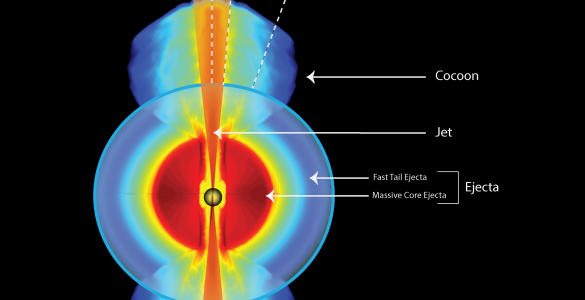 The super-sharp radio “vision” of a continent-wide collection of NSF radio telescopes answered an outstanding question about the aftermath of the merger of two neutron stars. 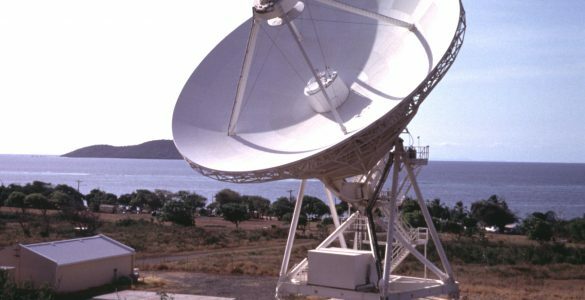 The National Science Foundation has provided funding to repair damage to the Very Long Baseline Array station on St. Croix caused by Hurricane Maria in 2017. 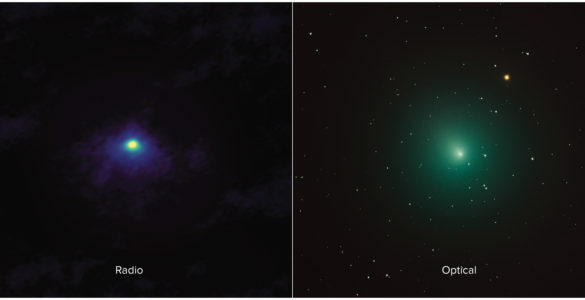 As comet 46P/Wirtanen neared Earth on December 2, astronomers using ALMA took a remarkably close look at its innermost regions. Saturn’s frigid moon Titan has a curious atmosphere. 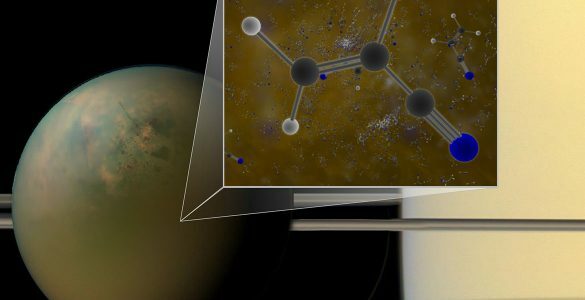 In addition to a hazy mixture of nitrogen and hydrocarbons, like methane and ethane, Titan’s atmosphere also contains an array of more complex organic molecules, including vinyl cyanide, which astronomers recently uncovered in archival ALMA data. Under the right conditions, like those found on the surface of Titan, vinyl cyanide may naturally coalesce into microscopic spheres resembling cell membranes. 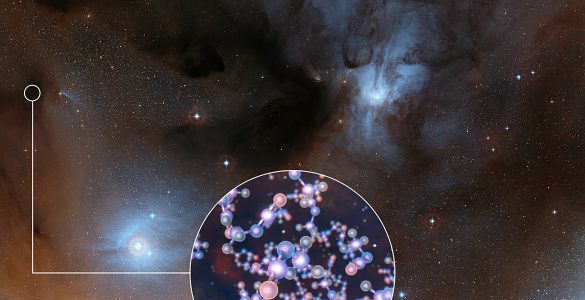 ALMA has observed stars like the Sun at a very early stage in their formation and found traces of methyl isocyanate — a chemical building block of life.